In December, the most prestigious awards of the UK’s hot tub and swimming pool sales market were held, the “UK Pool & Spa Awards”, which have been running now since 2010. 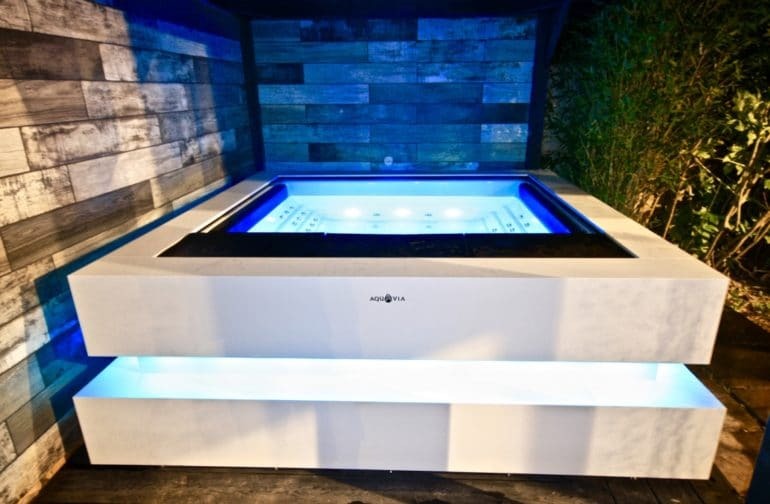 Our dealer Bespoke Buildings & Spas took part in 2018 with one of Aquavia’s Cube hot tub systems and was a winner in the “Above Ground Hot Tub Award” category. The award-winning installation is an outdoor hot tub that is installed below a wooden gazebo, with an interior porcelain tile wall that gives it an intimate feel. Andrew Newsome, the Manager of Bespoke Buildings & Spas, explained that: the customer wanted a top-of-the-range hot tub and after reading up on all of the hot tub manufacturers, chose Aquavia Spa after they saw the Cube hot tub model, due to its striking design. Aquavia Spa would like to thank Bespoke Buildings and Spas for the project that they carried out and the acclaim received.